Robert Lindsey (1917-1995) was not only my teacher, he was also a surrogate father. My own father was never able to visit Israel. I became interested in the words of Jesus when I gave my life to the Lord in the summer before my sophomore year in high school. Although I was enamored with the words of Jesus, I found many of his sayings difficult to comprehend. 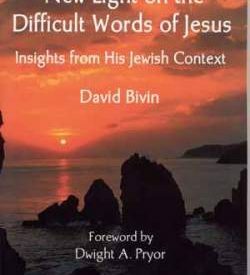 It was only later, after I had studied a few years in Israel, that I realized this difficulty was a result of my lack of knowledge of Jesus’ Jewish culture and Jesus’ native language. During my junior year of college, my father, J. C. Bivin, a Rotarian, kept urging me to fill out the application forms for a post-graduate scholarship offered by Rotary International. This grant, known as a Rotary Foundation Fellowship, provided for a year of study abroad. I knew I had little chance of winning this fellowship, but to get my father “off my back,” I submitted the application. Thus it was that in the summer of 1962, I found myself competing with thirty-one other candidates for this Rotary fellowship. Although I had only a three percent chance of winning, I was chosen to receive the grant. I won in the selection process not because I had the highest grades of any candidate, but because I had worked my way through college while participating in college sports. It seemed to the Rotarians that I was more “well-rounded” than the other candidates. I decided to study at the Hebrew University of Jerusalem because I wanted to learn Hebrew in preparation for a career as a Christian minister. I believed my future congregants would expect me to have a knowledge of Hebrew in order to rightly interpret for them the Hebrew Bible. When I arrived in Israel I had no idea that Hebrew would also be a key to understanding the words of Jesus! David and Josa flanked by Dr. Robert and Margaret Lindsey. I arrived in Israel on July 4, 1963. In mid-July I began the Hebrew University’s summer ulpan (intensive Modern Hebrew language program). After two and a half months of ulpan, I started classes at the university. I remember that one of my classes was “Introduction to the Archaeology of Eretz Yisrael [Land of Israel]” taught by famed archaeologist and excavator of Masada and Hatzor, Yiga’el Yadin. During that first year in Israel, I searched for a church home. I visited all the Christian congregations in Jerusalem—there were not that many in those days. The only pastor I found who was focusing on the Hebraic background to the words of Jesus was Robert (“Bob”) Lindsey. The story of how I happened to visit the Narkis Street Congregation is of significance. It happened because Professor Anson Rainey made a special trip to the Maizler Building at the newly built Givat Ram campus of the Hebrew University, where my ulpan was being held. He looked up the director of the ulpan, the legendary Aharon Rosen. Anson asked him: “Do you have any Christian students in this year’s ulpan?” Rozen answered: “Yes, we have two.” Anson waited around until there was class break. Then he introduced himself to me and invited me to attend services at Narkis Street. Especially attractive to me was the Saturday-morning Bible study. There, I saw Bob, Anson, Halvor Ronning, and three or four other members of the class, books piled high on their knees, studying the words of Jesus. That was exciting! By the beginning of my second year in Israel, I was attending the Narkis Street services regularly. In those days the congregation numbered about fifteen, and on a good Saturday morning, there were about twenty-five people present for the worship service. 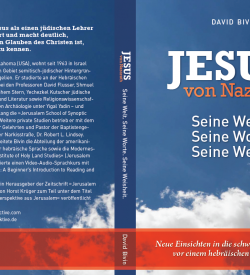 At Narkis Street, and in my studies of Second Temple-period Jewish history, languages and culture at the university, I began to see that the keys to a deeper understanding of the words of Jesus are a fluent knowledge of Hebrew and a thorough knowledge of rabbinic literature. Dr. Robert Lindsey and Professor David Flusser officiated at the Bivins’ wedding. In this photo Professor Flusser recites some of the traditional blessings prayed at a Jewish wedding. Before the end of my first year in Israel, I became Bob’s disciple, having a weekly private lesson with him for the next twenty years. Bob taught me about the life and words of Jesus (of course, without charge!). At first, Bob and I met in his hideaway near Harlap Street in Rehavia; but, after 1967, we met at Jerusalem House near the Mandelbaum Gate. I was still meeting with him when he and Margaret lived in Sheikh Jarrah in East Jerusalem, just before they retired (in 1987) and returned to Oklahoma. Yes! Bob was an Oklahoman! So was I, and Steven Notley, Dwight Pryor and Brad Young. Bob was not only my teacher, he was also a surrogate father. (My own father was never able to visit Israel.) Bob was the same age as my father (both born in 1917—and, by the way, Bob’s colleague, Professor David Flusser, was also born in 1917). Bob arrived in Israel for the first time in 1939, the year I was born. When I arrived in Israel, I was twenty-four, and Bob was forty-five—and I thought he was SO old! Josa met me for the first time at the congregation’s weekly Bible study. Josa and I were engaged within a month, and married within two months. The wedding, on October 1, 1969, was conducted in Hebrew by Bob and Professor Flusser, and took place in the outdoor theater and tennis court behind the chapel—where the parking lot is today. One hundred thirty guests were present—Jews, Arabs, Christians, Armenians, professors at the Hebrew University, Rotarians, members of the congregation, and others. The wedding and all that went with it—photographer, accordionist—for the Israeli folk dancing after the wedding—food, flowers, and everything—cost one hundred fifty dollars, all the money Josa and I had, we though about getting quick loans after realizing we had spent all our money. The morning after the wedding Bob drove us to our honeymoon destination, his and Margaret’s cottage in Poriyah, in the hills above the Sea of Galilee. I did not know much when I began studying with Bob—but I was an eager student and had lots of questions. Here is an example of the kind of interchanges that took place between us. It comes from Bob’s last years in Israel, when I was meeting with him in his and Margaret’s apartment in Sheikh Jarrah in East Jerusalem. David and Josa Bivin on their wedding day, October 1, 1969. Bob had no answer, so the following week, at our next meeting, I asked him the same question. Bob suggested several solutions to the problem, but none of them satisfied him or me. Peter’s answer, as recorded by Luke, may explain Jesus’ tremendous explosion of promises to Peter: “On this rock I will build my church…I will give you the keys of the Kingdom of Heaven…whatever you bind on earth will be bound in heaven” (Matt. 16:18-19). For perhaps the first time, one of Jesus’ disciples had understood that Jesus was more than just messiah! Peter’s answer may be the most shocking declaration in the Synoptic Gospels of who Jesus is. Apparently, Mark did not understand the Hebraism that surfaces in Luke and modified his text to read, “You are the messiah” (Mark 8:29). Matthew also modified his text. He explained “messiah” as “the Son of God.” In Matthew’s Gospel, Peter says: “You are the messiah, the son of the living God” (Matt. 16:16). In the life of Bob Lindsey we have seen a living example of a great principal taught by the rabbinic sage Haninah ben Dosa. Haninah said: “Anyone who people love and are delighted with, God is delighted with. And anyone who people don’t love and are not delighted with, God is not delighted with” (m. Avot 3:11). People who knew Bob loved him and were delighted with him. My father in Oklahoma, J.C. Bivin (1917-2002) as he looked in 1983. J.C. was a high-school undefeated wrestling champion, pipeliner, pipeline construction contractor, Rotarian, but, most proudly, owner and trainer of the 1987 PHBA Open World Champion cutting horse, Gay Holly Bars. 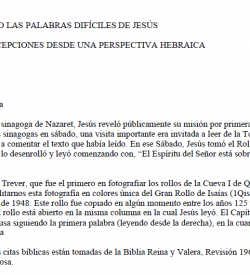 This essay is based on a talk David Bivin delivered at the “Entering the Kingdom of Heaven: The Legacy of Dr. Robert Lindsey at Narkis Street Congregation in Jerusalem” conference in 2015. 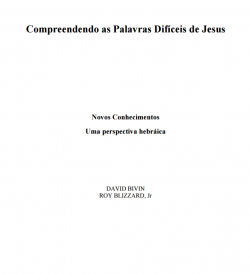 Click here to see a video of David Bivin’s oral presentation. Beautiful story, David, poignant and inspiring! Thank you ever so much for sharing with us!